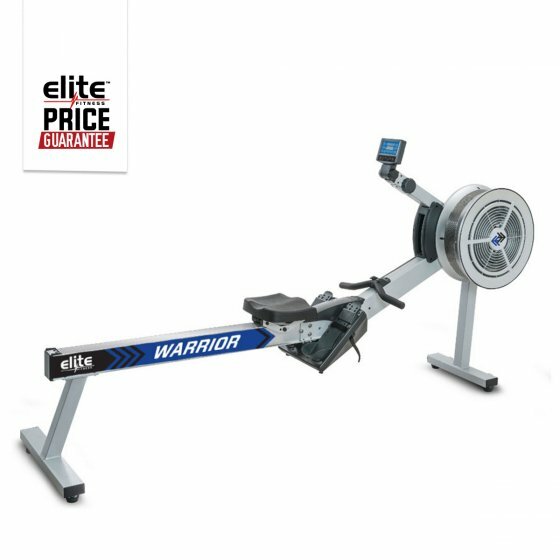 The Warrior Rowing Machine is the latest Heavy Duty rower to be added to our range. With its ergonomically shaped handle, perfectly moulded seat with adjustable foot plates and adjustable resistance knob the Warrior Rower will help tune up your rowing technique and take your training to the next level. The Warrior Rowing Machine is a great low impact cardio exercise that offers 8 levels of wind resistance and a wide range of built-in training programs for total body workout. Work up to 84% of your body’s muscles including the large muscles in your legs, glutes and back and perform HIIT sprints and Intervals, combining with Elite Hand Weights for a whole body Muscle & Cardio Workout. The easy folding mechanism will allow you to simply fold it up and wheel it away for easy storage and wheel into place in your training area with a pull of a handle to fold down and use. Whether it be training at home for distance or doing your favourite WOD in a circuit type situation your body will be tested to its very limits. Come and try the Warrior Rowing Machine with your next visit to an Elite Fitness store or just take my word and get yourself the very best rower to snap your fitness back into play.